Sigma Homes only became aware of baby Kate’s story when our project manager David Holmes heard Neil Prendeville discuss their needs on his radio program. Believing we could help, we arranged to visit Lisa, Kate’s mum at her home in Cobh. 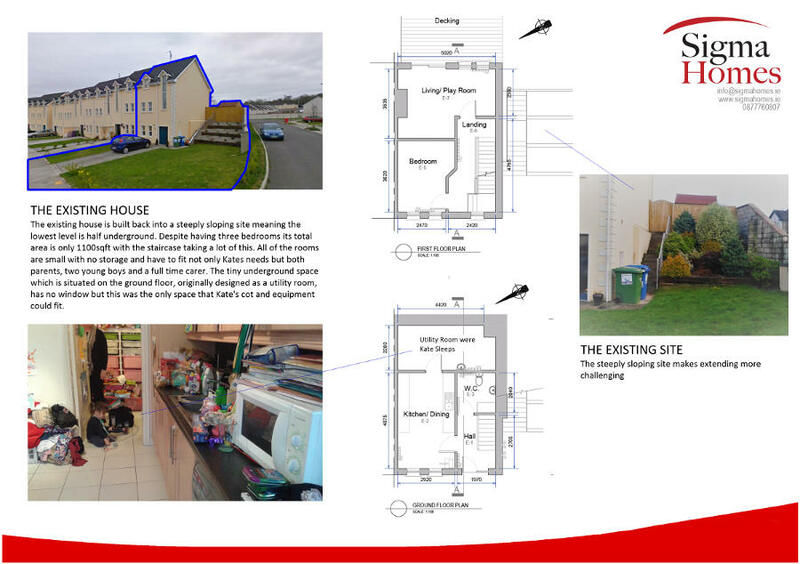 We understood that Lisa had been told that the current arrangement of her house would make it difficult if not impossible to extend, however given the variety of projects we have worked with in Cork we felt we might be able to help. The existing house is built back into a steeply sloping site meaning the lowest level is half underground. Despite having three bedrooms its total area is only 1100sqft with the staircase taking a lot of this. All of the rooms are small with no storage and have to fit not only Kate’s needs but both parents, two young boys and a full time carer. The tiny underground space which is situated on the ground floor, originally designed as a utility room, has no window but this was the only space that Kate’s cot and equipment could fit. 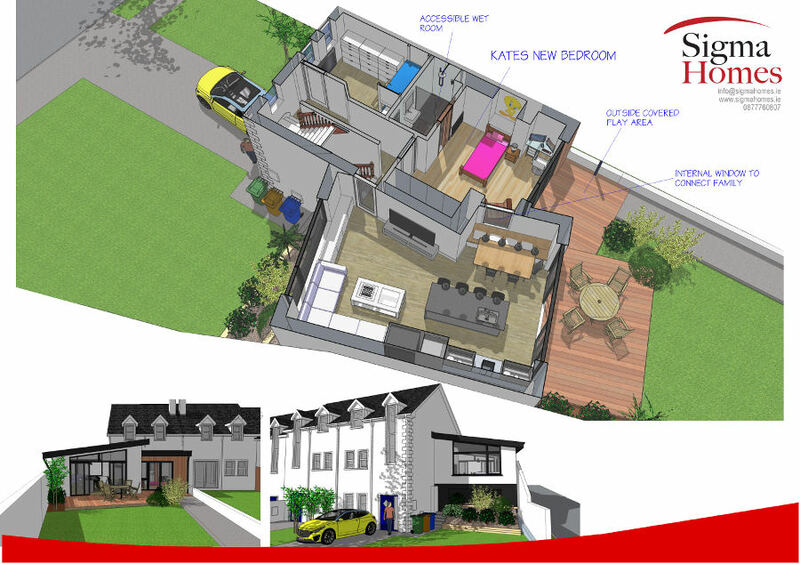 Straight away we decided that the project would not be successful if all we provided was a larger room for Kate; we thought; we may solve an immediate physical need, but the family’s wellbeing and standard of living might suffer, as a result. The solution was to provide a house that would mean the whole family could be together. The design we propose relocates Kate’s living quarters up onto the first floor; providing her with a large glazed window view and a door accessing the rear garden. Kate would have an en-suite wet-room with the facilities to cover all future needs. There is also space in her room for the carer’s workstation as well as storage for Kate’s medical supplies and equipment. We also propose to create a new bright, airy open plan living space with direct access out onto the rear garden. Fundamental to the design are the internal windows linking the family space to Kate’s room, so even when Kate’s tired she can partake in family life. Sigma Homes take pride in bringing special design features to all our projects and it was a real pleasure to add these throughout this build for such a worthy cause. Our thanks also go to Michael McCarthy at MMC Quantity surveyors for completing a comprehensive review of the project estimating the total build cost including professional fees would normally stand at around the €140k. We at Sigma Homes feel that we can bring €60k of savings to this figure through both ourselves, subcontractors and suppliers. We would then ask the people of Cork to dig deep so we can fund the remainder of this project for a highly deserving family.